Love Acts is a team of volunteers seeking to follow in the steps of Christ reaching out to the homeless community by extending a helping hand up. We are a Non-Profit registered with the State of Texas. Our approach to fighting Homelessness is to make connections, build relationships accompanied by trust and respect. We offer kindness in the form of meeting physical needs, but our focus is to meet spiritual needs. We offer not just a hand out but a hand up in in love. We lead our new-found friends on a journey towards reconciliation with God, family and society. In this process we share the Gospel of Jesus Christ. A true friend stays around for the long term. We continue to offer guidance and friendship helping our fellow Christians to self-sustainability for the long term. We also encourage, empower and guide our fellow brothers and sisters in Christ to courageously step outside the confines of the Church building onto the battle field. Luke 10:2 says "Jesus told them, the harvest is plentiful, but the workers are few. Ask the Lord of the harvest, therefore to send out workers into the harvest field"
You do not have to get on a plane, boat or train, go across the country or to a distant foreign land. There is a ministry field in our own back yard There are thousands of lost souls right here living on the streets and in camps in Tarrant County. We need more workers to reach them. We fight the demons of homelessness on the front lines typically with the unsheltered in the streets, camps and wherever we find them. We guide fellow Christians into the same environments. Matthew 9:12 "It is not the healthy who need a doctor, but the sick" Jesus did not come to pursue the religious elite. He came to pursue the afflicted and poor in spirit those that are lost. Our work is to learn, listen, love, mentor and coach to defeat homelessness. It is through actions tempered with kindness that we prayerfully guide others lost in sin to a more abundant life. We do this by listening first to learn what is needed and then help those we encounter toward solutions. The answers take different forms such as resources in housing, counseling, rehabilitation, employment, transportation, group therapy and other aid that will help them achieve self-sustainability. We firmly believe through God all things are possible. 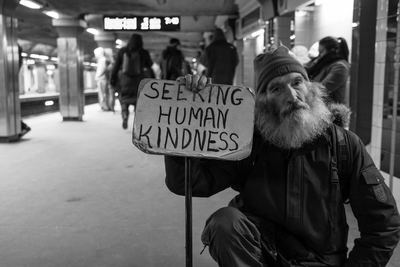 We conduct in house homeless ministry seminars and presentations within Churches and organizations to recruit, teach, plan and lead fellow Christians into the mission field. They become partners in the battle against homelessness and the evils that accompany the condition. Become a Warrior of Hope and join the battle!